[Satnews] As NSR has previously noted, M2M/IoT remains primarily a narrowband communication medium, typically used for meter readings and other small packet data applications. However, these are by no means the only use cases, with many bandwidth heavy new applications and services for M2M/IoT under development. 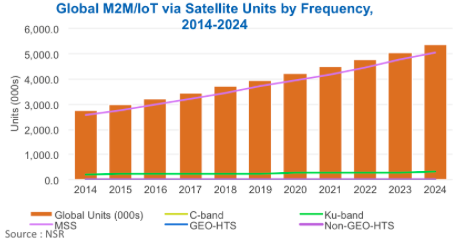 As such, M2M/IoT units are already starting to move away from L-band to Ku-band in some limited niche markets, with HTS M2M/IoT usage expected even further down the track. In NSR’s recently released report, M2M and IoT via Satellite, 6th Edition finds the vast majority of in-service units currently and in the future are considered MSS (largely L-band), increasing from 2.56 million units in 2014 to over 5.06 million units by 2024. Ku-band in-service units form a minority increasing from 207,000 to 308,000 over the same period. Meanwhile in 2024, just over 13,000 HTS units (including both GEO- and non-GEO-HTS) will be in-service. A number of factors drive these differing growth rates. Ku-band VSATs are typically used in situations where significant amounts of data need to be processed. For example, in the Aeronautical market, Ku-band increases from a 12.0percent revenue share in 2014 to a 21.7percent share in 2024. Ku-band permits new kinds of telematics data to be streamed back to base, and at a high frequency and poll rate. The expected introduction of Ku-band flat panel antennas should speed up deployment of Ku-band based M2M solutions, especially for units on the move, such as the connected car. Ku-band has a higher penetration rate for Oil & Gas, Utilities, and Green Energy applications, all of which have high bandwidth requirements for certain applications. Nevertheless, while revenues from Ku-band have similar growth to MSS (6.4 percent and 6.5 percent CAGR respectively), the much smaller base means that in absolute terms, MSS is a clear standout for revenue growth. One weakness for Aero Ku-band usage is that L-band solutions are the only frequency currently permitted by safety regulations by most aviation and maritime safety authorities. Furthermore, costs can be significantly higher for fleets, where one VSAT is required for each terminal and device, with costs adding up quickly, and generally pushes fleets towards MSS. Unlike MSS terminals, which can be connected to a single device, say a meter reader, Ku-band terminals are often times connected to a multitude of devices and appliances, resulting in a backhaul type solution, which is generally practical for fixed devices. Newer applications such as CCTV can leverage this to provide either full-time streams, or costs can be reduced by setting up ‘trigger’ alerts when to start recording or sending still captures. This type of ‘trigger’ function can be implemented in other applications such as agriculture, or say Utilities to begin high frequency polling during an emergency situation. MSS dominates in terms of both revenues and in-service units, and this is due to the low bandwidth utilisation of most M2M systems – typically meter reading (e.g. speed, temperature) and location data. Lower cost terminals mean that when a network is starting from scratch, terminals can be rolled out across a fleet compared to other applications, and the marginal cost of adding in new devices or vehicles is reduced. As for other frequencies, C-band is only used in very niche markets, typically for data intensive and backhaul type solutions. Non-GEO-HTS (MEO/LEO) terminals are expected to remain even more niche, due to high cost requirements for terminals. The lower cost per bit does not translate to total cost of ownership due to the lower bandwidth utilisation rates on M2M/IoT networks. GEO-HTS has higher take-up rates due to the longer availability of the terminals, but likewise take-up remains low, except for very specialised applications requiring effectively a constant data connection to record data, such as scientific research or some forms of telematics solutions. Nevertheless, operators such as Orbcomm, Globalstar and potentially new entrants, are all betting their money on narrowband connections in the future. A number of terrestrial competitors (or partners) are doing the same. So while there are opportunities that exist on VSATs, it does remain in a minority compared to MSS. MSS dominates M2M/IoT via satellite connections, and is the primary focus for all players in the field. There are very limited opportunities for M2M/IoT over HTS and generally speaking, NSR recommends avoiding developing ‘pure M2M/IoT HTS play’ products and technologies. Nevertheless, VSAT opportunities exist in niche markets, most notably Green Energy, Aeronautical, Oil & Gas and Utilities sectors. For Ku-band operators, growth opportunities lie in leveraging existing customers to implement M2M/IoT technologies, while introducing new applications and data analysis layers to integrate into M2M/IoT networks, which require large volumes of data. So in the battle of the bands, the clear winner was, is and will continue to be MSS; however, opportunities for new applications and services, as well as some cannibalization of the MSS value proposition, will lead to continued revenue streams for Ku-band. As a service provider or capacity player, diversifying one’s frequency offering should ensure long term strategic positioning as end user requirements evolve.